I logged in with GitHub but still don’t see the GitHub-connected app(s) I’m expecting to see! I am having trouble accessing my GitHub organization in Skylight. I’m trying to add a repo to my Skylight app but I don’t see the field to do so. I’m having problems connecting my Skylight app to a personal GitHub repo. I followed an email invitation and signed up with GitHub. How come I don’t see any apps when I log in? I ran a memory profiler. Why are so many object allocations attributed to Skylight? What if I need to load the Skylight gem before Rails? I’m suddenly seeing many more requests than usual and my bill has gone way up, but my app has very few page views. What’s going on? Having trouble with the agent? Take a look here. Before proceeding, make sure that you are running the latest version of the Skylight agent. If you’re still having trouble after following this guide, please drop us a line. Pro Tip: On Heroku you can access your production terminal with heroku run bash. The skylight setup command automatically generates a valid config/skylight.yml file. If you have edited this file, check that you haven’t introduced any syntax errors or invalid configuration. If you have removed this file, you will need to set the equivalent environment variables in any environments where you are running Skylight. See also our documentation on setting your authentication token. If you are still having trouble, please run Skylight.instrumenter.config in your production terminal, and contact us with the results. By default, Skylight uses your Rails tmp path as the sockfile directory. This directory must be writeable and cannot be located on an NFS mount (e.g. Vagrant). Set daemon.sockdir_path in your config to a writeable, non-NFS path. By default, Skylight writes logs to log/skylight.log. In the event that this path is not writeable, set log_file in your config to a writeable path. Verify that the Skylight gem is in the right group and that you have run bundle install. Check the Skylight agent server requirements to make sure your platform is supported. To avoid taking your production application down due to an installation failure, Skylight does not raise an exception when it can’t install the native agent. If you’re running a compatible OS and still see this warning, it’s possible that when the gem was installed, the native extension libraries failed to download from S3. If this is the case, re-installing the gem with bundle pristine skylight may fix the issue. If you still see errors after re-installing, try running your application with SKYLIGHT_REQUIRED=true. This will cause Skylight to raise an exception when the native agent is missing. This exception may be useful in troubleshooting the problem. If you need help, send the exception message and backtrace to us at support@skylight.io. Likely this is due a temporary network issue. Please try again. If curl fails, you may need to allow access to *.skylight.io on port 443 (e.g. if you are behind a firewall). Finally, check our Status Page for the unlikely event that we are experiencing infrastructure issues. Do you have the latest version of the Skylight gem? Find the latest version on RubyGems. Did you deploy your app since setting up Skylight? Sometimes people forget to deploy their change. Oops! Don’t worry, we won’t tell anyone. 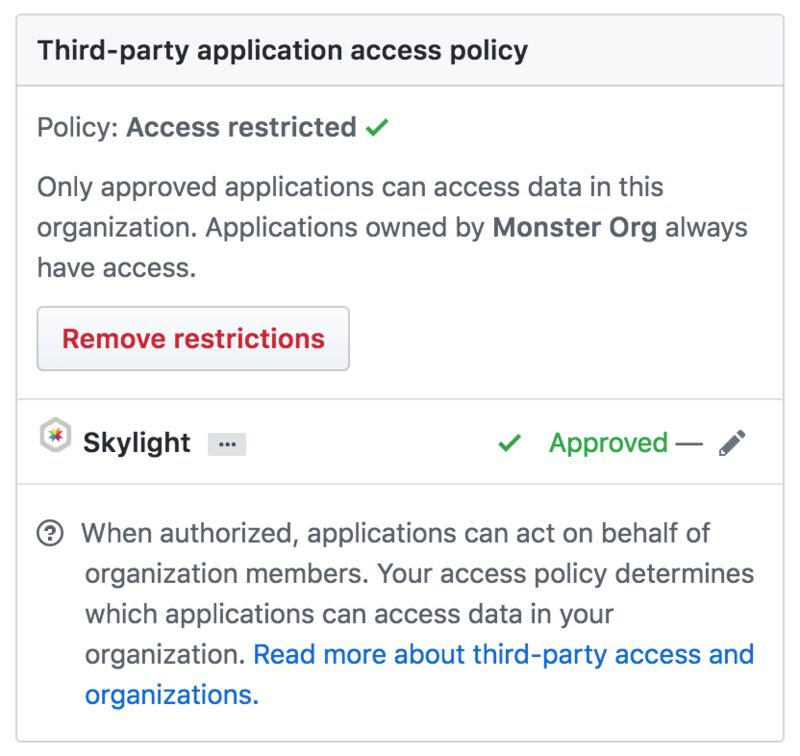 Has your app received any requests since deploying with Skylight? Make sure that there is traffic to your application. If your Rails app is handling requests, you should start to see data in Skylight in just a few minutes. Is Skylight enabled in your current environment? Verify that the application is running with the correct Rails environment. By default, the agent only starts in the production environment, but this can be configured. To learn how to change what environments Skylight starts in, see Environments. Is the skylight gem in the right group? Verify that, in your app’s Gemfile, you’ve added the skylight gem to a group that will be installed in production. For example, if you add skylight to the development group, it will not run when you deploy to production. If you’re running Unicorn, did you restart your master? To make sure Skylight is activated, you may need to restart your Unicorn masters. IMPORTANT: If you notice that the pre-fork (master) has not restarted on a typical deploy, make sure that you run a true restart (stop/start), rather than a reload. You might see the “No data within this time range” message if the agent running in your Rails app stops reporting performance data to Skylight. If you were able to see data before but it has stopped working recently, restarting your server will usually fix the issue. If the agent encounters multiple errors in a short span of time, it will shut itself down. This is done out of an abundance of caution to ensure that a potential bug in the agent doesn’t bring down your app in production. We are working to add more logging to the agent so we can better diagnose what causes the agent to shutdown and recover gracefully in the event of an error. If you find this is happening regularly, please let us know! Please check your logs for Skylight errors. This is due to our use of two different compression algorithms for the data. In some rare cases, especially when there were only one or two requests in a range, there’s a slight mismatch between the algorithms. We hope to resolve this in future iterations. The Skylight agent will log errors to log/skylight.log or on Heroku in STDOUT (Look for lines starting with [SKYLIGHT]). This error indicates that a parent span (event sequence item) was closed before all of its children were. One common cause of this issue is a Middleware that doesn’t conform to the Rack SPEC. Specifically, “If the body is replaced by a middleware after action, the original body must be closed first, if it responds to close.” If you are unable to fix the Middleware, you can remove the Middleware probe with config.skylight.probes -= ['middleware'] in your Rails config (note that you will no longer see individual Middleware in your endpoints list or endpoint event sequences; all Middleware will show up as “Rack” instead). Skylight limits the number of unique span (event sequence item) descriptions in a request to 100 to prevent misbehaving apps from causing trouble. In most cases, this will be fine as even items such as similar repeated queries will be normalized into a single description (e.g. SELECT * FROM users WHERE id = 1 and SELECT * FROM users WHERE id = 2 both become SELECT * FROM users WHERE id = ?). However, if your request is extremely complex it is possible to exceed this limit. To resolve this issue, reduce the number of uniquely named items that you instrument. The request itself is very complex. For example, requests that generate a significant number of SQL queries have been known to trigger this error. 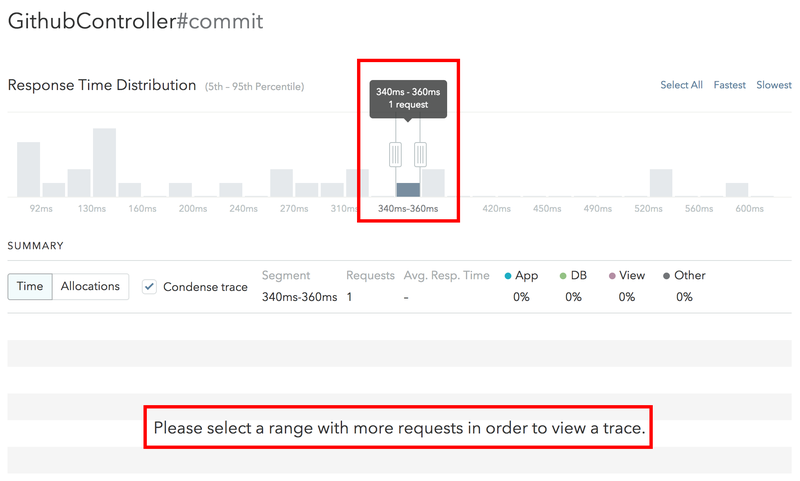 Be sure to check out our Performance Tips to reduce the complexity of your request. Your custom instrumentation is overly complex. Be sure to follow our custom instrumentation best practices. These errors indicate that the agent is unable to parse a SQL query in your application. There errors won’t prevent your application from operating, though they will reduce the information that we can display in the UI for these queries. They will be displayed in the Event Sequence as simply “SQL”, not the full sanitized query. Generally, the reason you will see this error is because you’re using a syntax we do not recognize (often a more complex or non-standard syntax). We’ve optimized for the most common syntax constructions and plan to support more in the future. When running across this error, please report it so we can learn what queries are important to our customers. If this error becomes too noisy, you can disable it by setting log_sql_parse_errors: false in your config. As per this issue in the agent repo, the fix for this is relatively quick. Just explicitly set daemon.sockdir_path in your config to a writeable, non-NFS path. First, try syncing your GitHub account with Skylight. If that doesn’t work, it’s possible the GitHub organization that owns the repo needs to whitelist Skylight in order for us to see that you are a member of the repo. Ask your GitHub org’s administrator to add Skylight to the whitelist, then sync your GitHub account again. You should then have access to the app(s) you expected to see! You are not the owner of the app on Skylight. You may contact the owner to have them add a repo to the app, or have them transfer ownership to you (this would entail transferring billing to you as well, so you may not want to do that). You are the owner, but are not logged in with GitHub. We need to verify your credentials, so be sure you are logged in via GitHub. Sorry, right now we only support repos that are connected to an organization, though we may allow use of personal repos in the future. Shoot us an email at support@skylight.io to let us know if this feature is important to you! This is actually a known bug, but it’s quite rare these days and we’ve had trouble reproducing it, so have had trouble fixing it. Please do email support@skylight.io and let us know exactly what steps you took when signing up, especially if there were any errors or issues along the way, or if you refreshed the invitation signup page at all before clicking “sign up with GitHub.” Any information about anything out of the ordinary helps! In the meantime, you can ask the person who initially invited you to send another invitation to the email address associated with your account. This will add you to the app automatically and you should have no further issues. Memory profiler gems like memory_profiler and derailed generally use Ruby’s ObjectSpace—a really nifty way to get information about all the objects allocated in your Ruby application that is great for troubleshooting memory issues. This line looks at an object and asks ObjectSpace who caused it to be allocated. As it turns out, objects allocated at require time are attributed to the file that calls the original Kernel#require method. Now, this is all well and good except for one small problem: Skylight overwrites Kernel#require in order to properly install probes. This means that it is Skylight that calls the original Kernel#require, not whatever other gem is really doing the require. So, as soon as Skylight is loaded, every future require call is attributed to Skylight. Skylight isn’t the only library to do this. ActiveSupport has a similar hook in it’s Loadable module that is included into Object. Without Skylight, it would be ActiveSupport taking the blame. However, because this hook uses super, it calls to the superclass Kernel that is now the version that Skylight created. Even RubyGems itself gets in on the overwriting behavior. Though, if you use Bundler (as everyone is), this is actually reversed. So there you have it, run derailed without Bundler and you’ll see RubyGems blamed for your requires. Add in Bundler and the correct files will get blamed. Bring in ActiveSupport and then ActiveSupport will be blamed. Include Skylight and blame will shift to us. Good times! So what’s the moral here? Know your tools. ObjectSpace and the libraries that use it do some really useful things. They aren’t perfect, but they’re open source. Read the code and find out a bit about how they work and you’ll be able to put them to better use! Skylight performs setup when the gem is required, at which time Rails will be detected and tapped into. However, you may find you have to manually require skylight/railtie if you need to load the Skylight gem before Rails. Unfortunately, it’s possible that your app has been the target of some malicious bots or abusive requests. Even if you see very few page views, that is not an accurate indicator of how many requests your app is receiving behind the scenes. An overzealous health checker is another possible source, if you are using such a service. If you want to avoid seeing these requests in Skylight, we recommend placing Rack::Attack at the top of your middleware stack (good practice even without Skylight) and then running Skylight immediately afterward. This should help you confirm which IP address is making all those requests! If you’re curious, you can try to look up the IP address with a search engine to find the website associated with the IP address.